Candlewick Press, 2007. 295 pages. Dinah and Zeke and Rebecca Ruth are stuck in a disaster. They are home alone in the middle of a storm of epic proportions with only their cousin Gage, who's barely an adult himself, to look after them. Gage decides to tell them a story, to take their mind off their hopeless plight. He tells them about a skibberee, more commonly called a Tooth Fairy. 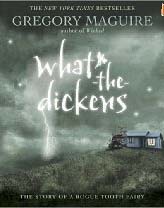 What-the-dickens was in a fix himself, from the moment he was born, not in a colony like most skibbereen. He didn't even know that the first words he heard weren't intended to be his name. After several adventures and narrow escapes that he doesn't realize are narrow escapes, What-the-dickens meets a tooth fairy on a job. Her name is Pepper, and she's having trouble getting her license to become an Agent of Change. She brings What-the-dickens back to the colony, but he doesn't fit in very well. With the dire situation of Dinah and her brother and sister, this book is a bit dark. But the intriguing story gives you the feeling of a light in a dark place. Definitely not your run-of-the-mill fantasy tale. Ideal for upper elementary school readers who want to try something different. Comment on this review from the	blog.